Photo courtesy of ESPN's twitter handle. 7'6" versus 7'6" and that isn't even our "spotlight game!" Check out our college basketball experts Tyler Bennett and Peyton Wesner's picks for tonight's action. They're back! After a two-day reprieve Tyler Bennett and Peyton Wesner are returning to what they do best; predicting college basketball games. Though, before the dynamic duo turns their sights to early season tournaments, which tip-off tomorrow, the two will again attempt to capture first place with nine games this evening. ---23.0 PPG, 11.0 RPG, & 1.0 BPG. ---32.0 PPG, 6.0 RPG, 5.0 APG, 8.0 SPG, & 2.0 BPG. Illinois has struggled mightily to open the season, losing to North Florida and then having to come from behind to top North Dakota State. The road doesn’t get any easier, as they head out on the road to take on Kris Dunn and the Providence Friars. Illinois’ depth has been severely affected by injuries to several key players, such as Kendrick Nunn and Jaylon Tate, and the door is wide open for a big Providence win. Illinois is facing Providence? There are as good as "Dunn!" Thanks to "jazzy junior" Kris Dunn returning for the 2015-2016 season, the Friars have a bona fide stat sheet stuffer suiting up for them. On Friday, last year's Big East Co-Player of the Year started off his newest campaign in grand fashion, for he posted a career high 32 points and 8 steals in addition to 6 rebounds, 5 assists, and 2 blocks! Complementing Dunn's performance, sophomore Rodney Bullock played very well by chipping in 20 points and 6 rebounds. Though an exact replication of their performances is not likely tonight, Dunn and Bullock are sure to have good games against a depleted Fighting Illini squad that is trying to overcome a plethora (that is an understatement) of injuries in the backcourt. While Mike Thorne Jr. will attempt to do all he can, it will not be enough this evening. ---22.0 PPG, 5.0 RPG, & 1.0 SPG. ---16.0 PPG, 11.5 RPG, 2.0 APG, 2.0 SPG, & 2.5 BPG. Last season, the Wofford Terriers were a premier mid-major team thanks to the play of Karl Cochran. This season, Wofford will still contend in the Southern Conference, but losing Cochran has taken away some of the appeal. Taking on the high-powered North Carolina Tar Heels, it will take a Herculean effort for the Terriers to take them down. Brice Johnson, Justin Jackson, and company will simply be too much for Wofford. If North Carolina had no trouble putting away Temple without Marcus Paige, then Wednesday night against Wofford will be a cake walk. Though the Terriers are a quality mid-major, the Tar Heels have arguably the best five players on the court in Kennedy Meeks, Brice Johnson, Nate Britt, Joel Berry II, and Justin Jackson. As Roy Williams' squad is bound to run away with this one, keep an eye on Wofford freshman Fletcher Magee. Considering Magee dropped a team high 22 points versus Missouri on opening night, it will be interesting to see how he performs against the top team in the nation. ---13.5 PPG, 6.5 RPG, 2.5 SPG, & 2.5 BPG. ---15.0 PPG, 8.0 RPG, & 1.0 BPG. In the Bearcats’ first two games, they have looked like a well-oiled machine as the team has had six different players averaging over 10 points per game. Bowling Green is coming off a win over New Orleans, and they looked impressive in their own right. Going on the road against a strong team like the Falcons will be tough, but Octavius Ellis has put up big numbers in limited minutes this season, and he’ll lead the Bearcats to another big performance. In their last game on Sunday, the Cincinnati Bearcats past the century mark with 106 points. "Wait, aren't the Bearcats known for their defense?" Yes, but this season it has been all offense. Led by six double-digit scorers, including "star senior" Octavius Ellis, Cincinnati is averaging 101.5 points per game. Although they will not hit the triple digits tonight, expect for a re-emergence of defensive prowess in a win over Bowling Green. ---18.5 PPG, 4.0 RPG, 4.0 APG, & 1.0 SPG. ---20.0 PPG, 4.5 RPG, 2.0 SPG, & 1.0 BPG. The NC State Wolfpack are coming off an upset loss to William & Mary in their opener, before rolling over South Alabama their next time out. The team is looking to build onto their win with another over the Jaguars. But, they need Cat Barber, Beejay Anya, and Maverick Rowan to be more consistent. The team is hungry to prove their loss was a fluke, and that’s bad news for IUPUI. The Jaguars have played extremely well this season, and will play the Wolfpack close. But, NC State comes out on top in the end. IUPUI is back on the map! Following a revenge victory over intra-state rival Indiana State, the Jaguars traveled to Milwaukee and gave Marquette all they could handle before falling in defeat. Will they be able to close the door against an already upset NC State team? In one of the most surprising upsets a season opener could bring, the Wolfpack fell to William & Mary, not by a few points, but by 17! Junior point guard Anthony "Cat" Barber had one of the worst games of his career as he finished the night 4 for 16 from the floor (11 points). No doubt he will need to have a better performance against free throw machine Darell Combs. Ultimately, this matchup will be decided by the young forwards of NC State (Caleb Martin, Abdul-Malik Abu, and Maverick Rowan) and the Loyola (IL) transfers (Nick Osbourne and Matt O'Leary) of the Jaguars. ---22.0 PPG, 6.0 RPG, 2.0 APG, 2.0 SPG, & 1.5 BPG. ---22.5 PPG, 5.5 RPG, & 1.0 BPG. This contest is an under-the-radar matchup between two talented mid-major programs who haven’t had the ball bounce their way this season. Bucknell fell apart in the second half against Wake Forest, while Robert Morris lost a nail-biter to Penn before a blowout loss to Cincinnati. Stars are on display in this one, as Chris Hass, Nana Foulland, and Bucknell take on Rodney Pryor and the Colonials. This one could go either way, but Bucknell has the depth to score a big road win over a premier opponent. This journalist's biggest concern for the Robert Morris Colonials this season was who would pick up the scoring around superstar Rodney Pryor. So far, it seems the answer is no one. Coming into tonight, the second leading scorer on the team is freshman Elijah Minnie with 7.5. That is absolutely unacceptable! On the other end of the floor, the Bucknell Bison have no issue putting "the biscuit in the basket" as following their superstar's (Chris Hass) 22.0 PPG, four players, including "fab freshman" Kimbal Mackenzie and "stud sophomore" Nana Foulland, are also posting double-figure averages in points per game. For many reasons, this matchup is intriguing, but the biggest has to be whether or not Pryor will be able to produce wins by himself on a nightly basis. ---10.0 PPG, 10.0 PPG, 2.0 APG, 3.0 SPG, & 1.0 BPG. Wednesday night marks the season opener for the Oakland Golden Grizzlies, and fans can bet they’ll be ready. Junior guard Kahlil Felder is one of the best scoring guards in the country, and with the addition of former high school teammate Sherron Dorsey-Walker from Iowa State, the Grizzlies are ready to roll in 2015-16. Eastern Michigan is coming off a big home win over Vermont, but Oakland has too much firepower for the Eagles to keep up. "Felder for three!" Last season, Oakland's Kahlil Felder was one of the most prolific sophomores in the nation when it came to scoring. How will he be able to top his past campaign? Find out tonight as the Golden Grizzlies take on Eastern Michigan in their season opener. Despite Oakland returning only Felder from their top three scorers, Jalen Hayes returns after being named to the All-Freshman team in the Horizon League. Though Eastern Michigan returns their leading scorer in Raven Lee, the "jazzy junior" was suspended indefinitely before the start of the season and will miss tonight's game. Although the Eagles were able to start their season with an impressive win over Vermont, a two game winning streak is not in their future. ---11.5 PPG, 6.0 RPG, & 5.0 BPG. ---18.0 PPG, 7.0 RPG, 5.0 APG, & 1.0 BPG. The UC Irvine Anteaters have rolled to a 2-0 start on the season, while the UCF Knights found themselves on the wrong end of a tight road contest at Davidson. Wednesday night marks the home opener for the Knights, and consequently the first road game for the Anteaters. The battle between 7’6’’ forwards Mamadou Ndiaye and Tacko Fall will be worth the price of admission in itself. In the end, the Anteaters use their experience to edge out a close win and move to 3-0. Tune in! 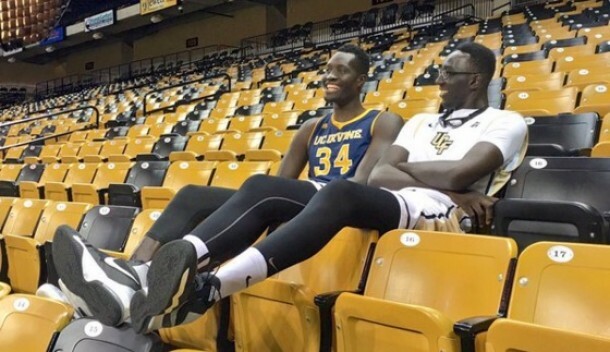 Whatever you do, make sure to tune into ESPN3 because the two tallest players in the country, UC Irvine's Mamadou Ndiaye and UCF's Tacko Fall, will face-off in Orlando. Yet, putting the amazing storyline aside, the Anteaters will spoil the home opener of the Knights and prevail in "City Beautiful" on the shoulders of the 7'6" Ndiaye. Now, if the Knights' "stud sophomore" B.J. Taylor was healthy, there is no doubt they would win this game. Sadly though, UCF's Adonys Henriquez will not be able to carry the team by himself. In a historic matchup for the sport of college basketball, the more experienced and better big man will take his team to 3-0. ---12.0 PPG, 16.0 RPG: & 1.0 BPG. ---16.5 PPG, 4.0 RPG, & 1.5 SPG. The Southern Illinois Salukis and Anthony Beane have looked rather impressive in their first two games of the season. While they have only played Air Force and Florida A&M, winning two straight to start is a big confidence boost right out of the gate. Kent State is coming off a closer-than-expected home opening win over Youngstown State, and Kellon Thomas did most of their damage down the stretch. The Salukis will score a close home win due to a bit more balance in terms of scoring. Kellon Thomas and Anthony Beane, let's get it on! In Carbondale, Illinois, this evening, two very good guards will go head-to-head in a pursuit to sustain perfection for another game. However, not them, but their supporting casts will decide the contest. The transferring of Jordan Caroline and Deon Lavender from the Salukis will finally be felt for the first time since their departure, for SIU will find it extremely hard to keep up with the Golden Flashes' Xavier Pollard, Chris Ortiz, and Jimmy Hall. Though, Mike Rodriguez, Tyler Smithpeters, and Sean O'Brien have started off the season well, they will have their first poor game against Kent State. ---19.0 PPG, 6.0 RPG, 2.0 APG, & 1.5 SPG. ---20.0 PPG, 3.5 RPG, 3.0 APG, & 1.0 SPG. In the spotlight game for Wednesday night, our attention turns to the MW/MVC Challenge, where there have already been some great games this season. A healthy Milton Doyle and a healthy Cullen Neal have rejuvenated their respective teams, and have pushed the Ramblers and Lobos to matching 2-0 starts. With talent on both sides of the floor, this contest comes down to one simple thing: home court advantage. Playing at "The Pit" is tough for any road team, including the Ramblers. In the end, the Lobos will come away victorious. Doyle Rules! Doyle Rules! This season, Milton Doyle, "jazzy junior" on Loyola, could not have started his season off any better by netting 20 and 18 points respectively. Also, Doyle hasn't been the only scorer "tickling the twine" thus far! Seniors Devon Turk, Montel James, and Earl Peterson have all picked up exactly where they left off last March by averaging double-digits through two games. Unfortunately, their averages are about to take a dip. Coming off Sunday night's rivalry win at New Mexico State, Cullen Neal's New Mexico Lobos are on the prowl for another victory. Excitedly for Lobos' fans, and like Doyle, Neal has not had to do it all by himself this season, for Elijah Brown has become a solidified scorer. As much as this journalist loves the Ramblers and superstar Milton Doyle, he sees home court advantage playing a big factor in a New Mexico win.